As entrepreneurs, the majority of our time should be spent marketing our business. I know, it's hard to admit, especially when we enjoy the "making" of our goods. And I know that I also become consumed in various aspects of my business, wanting to pretend I'm "creating", or I'm "marketing." And these are the times I return to my business educational materials for guidance. Product Leadership - being the best in our field...think Google for search engines. Concentrated Growth - resources are directed to the growth of a single product, in a single market with a single strategy. Market Development - opening additional geographic markets or market segments. E.g., for social media, expanding into another online marketing venue; advertising in a new media. Product Development - modifying an existing product for a new market. For example, Philadelphia Cream Cheese broadening into flavored cream cheese products and cooking ingredients. Innovation - developing a new product or service. Apple created few new products or services of their own, but they took the concepts to new mass markets. Horizontal Integration - acquiring product lines in the same stage as yours. For example, jewelers specializing in earrings begin to develop necklaces and watches. Vertical Integration - acquiring vendors or suppliers for sales growth. Many Etsy vendors begin to sell supplies as a way to increase their revenue. While basic and certainly not exclusive, this should give us a few examples of how to increase our business. Many of you may doing it already. If you create bracelets, are you also creating and selling watches? Horizontal Integration. If you create necklaces, are you selling supplies you no longer need? Vertical Integration. Recently, I've expanded my product line about as full as I can go with horizontal integration in simply the home fragrance market. I have three options for container candles, tea lights, then I moved into votives, then naturally into candle tarts. Soon to be announced are reed diffusers and other air freshener products. My horizontal integration is the home fragrance market. Unless I add more fragrances (product development), I will need to explore other opportunities for growth. While I realize Etsy is an extremely competitive market for home fragrances, I prefer not to venture into other online opportunities (Artfire, Zibbet). I believe social media can only handle one marketplace and prefer to direct these efforts to one shop. I do explore market development by trying to land my products into bricks and mortar retail environments and personalized products with event planners. I have ideas of where I am going from here, and do my best to frame the internal discussions with myself in basic marketing strategies. If you don't have a business background, I recommend you do some simple online research into some of these strategies. Last week, my post revolved around "venturing forward" and the need to take risks in our business. This week, I challenge each of you to take the risk into understanding basic marketing strategies and developing ideas on how to grow your business around them. I first "met" Natasha when she purchased some of my tea lights to include in her candle holders. A few weeks later, she purchased another set, and both times has asked me to include some business cards to promote my product. I’m returning the favor by featuring her lovely shop as today’s Etsy featured shop. 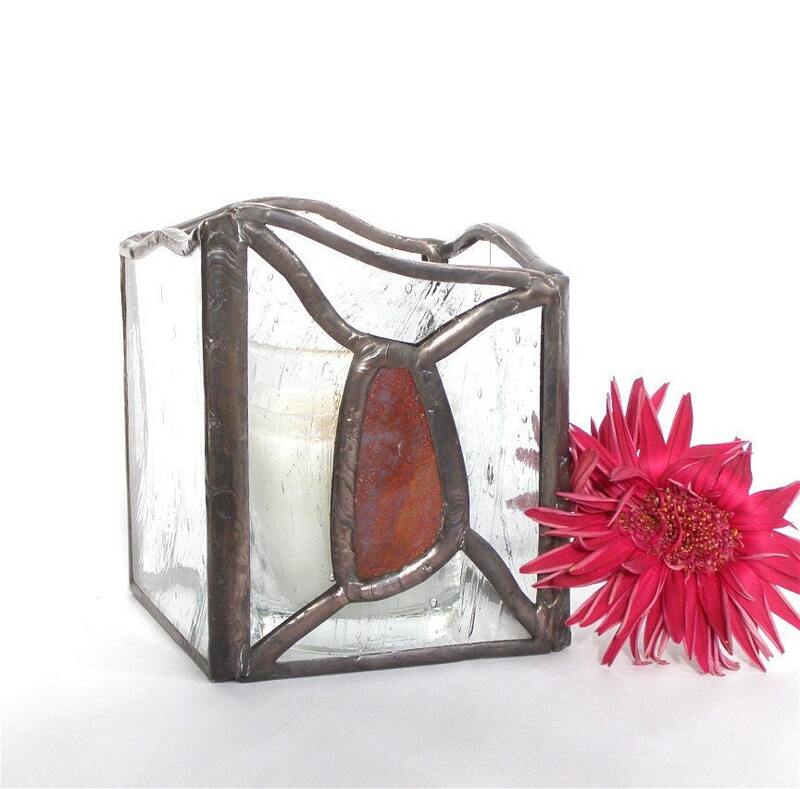 At Greenhouse Glassworks, you will find original fused glass and stained glass creations. Some of my favorite items are the candle holders I just mentioned. Natasha’s designs are all unique stained and fused glass creations. She finds her inspiration from plants, wide open spaces and the menagerie of animals from her studio that overlooks her horse farm in Western Colorado. And she communicates this feel through the beautiful photography that accompanies her artwork. 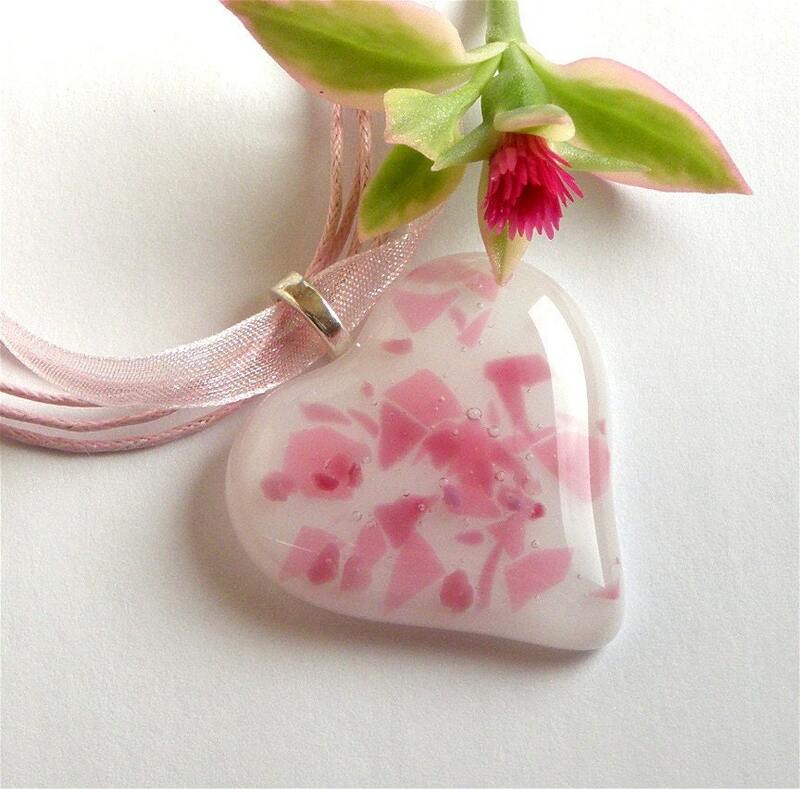 Browsing through her store, not only are you drawn to items for your own home, but you will find fused glass pendants, earrings and other jewelry which make wonderful gifts. And to accompany these gifts, you can include hand made gift tags and thank you cards which are made from reproductions of her original colored pencil drawings. Natasha is incredibly sweet and giving by supporting other artisans and their entrepreneurial efforts. Please take some time to browse through her shop. Her artwork is incredibly affordable, and you are sure to find something to give yourself or to a friend! Last week I wrote of my journey into capitalism and ideas on how to venture forward into a slightly known arena. This week I would like to celebrate my mother and her family for their courage to venture forward into very unknown territory. I spoke with my mother tonight, who relayed an earlier conversation with her sister-in-law. "Happy 65th Birthday!" my aunt said. "It's not my 65th!" mother replied. "Yes it is. You set foot in America 65 years ago today," my aunt insisted. January 24, 1947 my grandparents, my uncle and my mother arrived from a two week voyage across the Atlantic Ocean to venture forward into a new and better world. My grandparents each survived concentration camps, my uncle survived living away from his parents in order to be protected from the horrors of the world around him, and my mother survived by being born in the environment created by the terror and end of the days of World War II in Germany. And together they ventured forward. They left family, friends, and community behind in order to create a better world. They left careers, education, and a way of life behind in hopes to find the freedom and inalienable rights they knew should be theirs. They took huge risks. Mine so pale in comparison. So many times I look up to my grandmother, who became my best friend, and am amazed at the courage it took for her, simply, to live. But they also took calculated risks. They did not make decisions in a vacuum. I write this in my business blog because I think as entrepreneurs we all take risks. But as I reflect on my mother's "birthday", I find myself thinking of the risks I'm taking. Are they decisions made in a vacuum? Are they calculated risks? Or are they petty decisions I make in order to "advance" a hobby? It's difficult for those of us who work full time, who manage a family, who are trying to uphold New Year's resolutions to have clarity of thought to take calculated risks to advance our work. My challenge to you, to myself, is to look at our businesses, to be honest in what we see, and to take the risks necessary to succeed. The risk to develop an accounting system to analyze the profitability of our entrepreneurship. The risk to reach out to experts for help in marketing our business in order to succeed. And the risk to leave the product creation behind just a bit.....we won't succeed if we're creating and only hoping to sell our creations. We will only succeed if we take the calculated risks necessary to grow our business beyond a hobby. I have received much strong encouragement from my family, friends, and colleagues on my venture into capitalism with D'Lites by Dorene. In fact, some of my friends have been extremely strong supporters, as they know my frustrations with my day job and have seen the creativity my business has unleashed in me. One of the strongest recommendations I received in the beginning of my journey was to explore opportunities to become involved in weddings. I didn't follow this line for some time as I wasn't certain of how to do it. I mean, yes, candles are burned frequently at weddings, but doesn't every one just go somewhere to buy them in bulk? While familiar, I've become increasingly knowledgeable about high-end customization for weddings, parties, and other functions. So, I've been thinking about how to approach clients on how to include my candles on their special day. I will add my tea light sampler when it is ready, hopefully soon. But frankly, I'm stumbling a bit with information to mail for a cold call letter. Have any of you in the blogosphere worked with wedding or event planners? What recommendations do you have for entering into this line of business? One of the tasks I've struggled with since starting my business has been developing products for the season in a timely fashion. Fortunately, I'm small enough and have suppliers close to me, and I can be nimble in creating new products within a few days. And since a lot of sales come from my Etsy site, and since I refer a lot of local buyers to my Etsy site for a complete product listing, I haven't been adversely affected by this tremendously. Until I'm ready to prospect into retail. Just in time production works fine, until I try to promote my products to retailers....I suddenly realize that marketing Valentine products today is useless, as many retailers already have seasonal displays established or at least have their seasonal products purchased. So I knew I had to establish a marketing calender. But it couldn't be just a marketing calender, as it's easy to highlight holidays on a planner or electronic device. I needed to establish a marketing and production calender. I started with a basic Excel worksheet, labeling the left column with the months of the year and the planning schedule at the top. 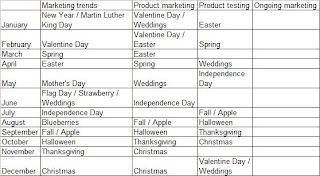 For my column headers, I chose "Marketing Trends", "Product Marketing", and "Product Testing." and so on. What this will do is help me integrate my supply purchases into other orders and help to save on shipping costs. I can work test pours into my customer pouring schedule. And if I order early enough, I have plenty of wiggle room if something isn't right, and I can integrate the successful fragrances into other supply orders, as well as watch for sales! 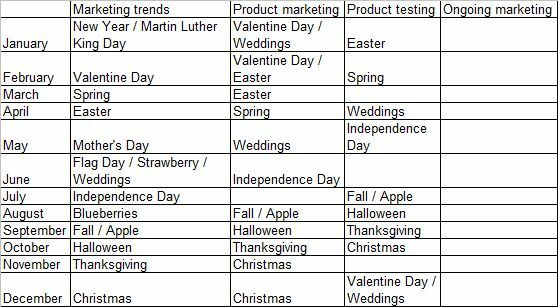 This hasn't quite solved my problem of marketing to prospective retail vendors, but it does help me establish a calender through which I can anticipate their marketing plans. All I have to do is add a column for when the stores would set up their retail displays, another column to anticipate when they will place their product orders, and integrate that into my testing and marketing calendar! Do you have any planning and marketing strategies you can share? One of the things I would like to do in this space is to give thanks to those who have helped me along the way. Just a few months ago, I was invited to join a team on Etsy, the Promotional Frenzy Team. While I will extend a public thanks to our fearless team leader at a later date, I would like to use this opportunity to thank my mentor, Patricia of Dell Cove Spices . First, and most important, the shop. If you are a food connoisseur (or even not! ), you simply have to try the products Dell Cove Spices offers. So far, I have tried popcorn flavorings Italian Parmesan and White Cheddar, the latter which is the closest to POPCORN NIRVANA I have every found! I was also sent a sample of their Barbeque Rub, which made my Barbeque Chicken Pizza come simply alive! And gifts galore! I ordered their cocktail sugars for coworkers and have heard glorious praises for their products! Second, Patricia is just a jewel. David, I’ve not met you yet, but I can’t wait for the day we convo or email! As a mentor on the team, Patricia has provided not just words of wisdom, but real life centering to make me think about how I’m running my business. So often, we get absorbed in our art that we forget about the business aspect. Even the most educated among us can forget that if we’re not making money, we just have an expensive hobby. Patricia provides that does of realism with a good dose of friendship. Dell Cove Spices is a company ready to burst at the seams. Terrific products with terrific people behind them. If you’ve not tried their products yet, please do. If you have, please continue to support them. Thanks so much for all you bring to our team! So many people love candles, and it’s been fun to see people’s reactions to what I sell. 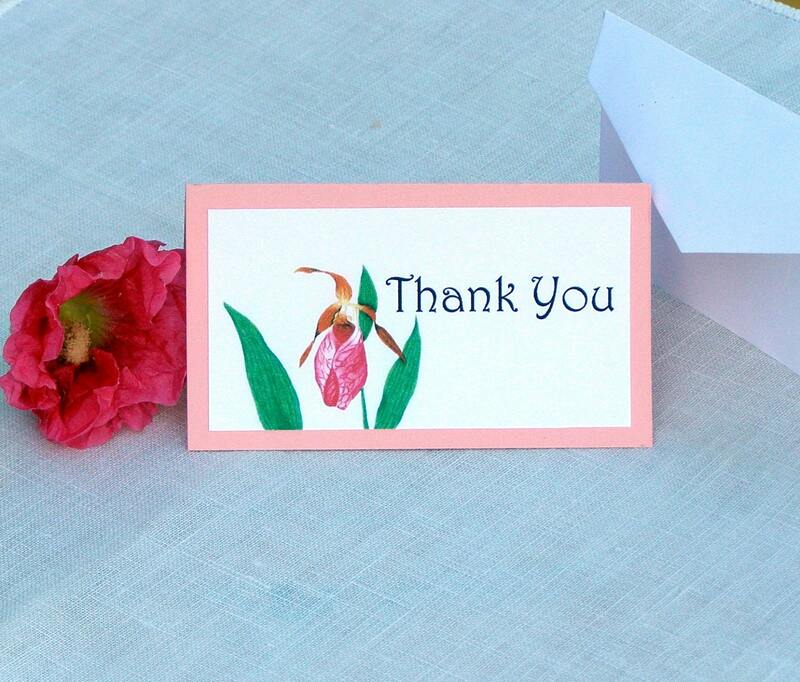 I truly listen to the comments and feedback I receive from my customers, vendors, and of course, my friends. 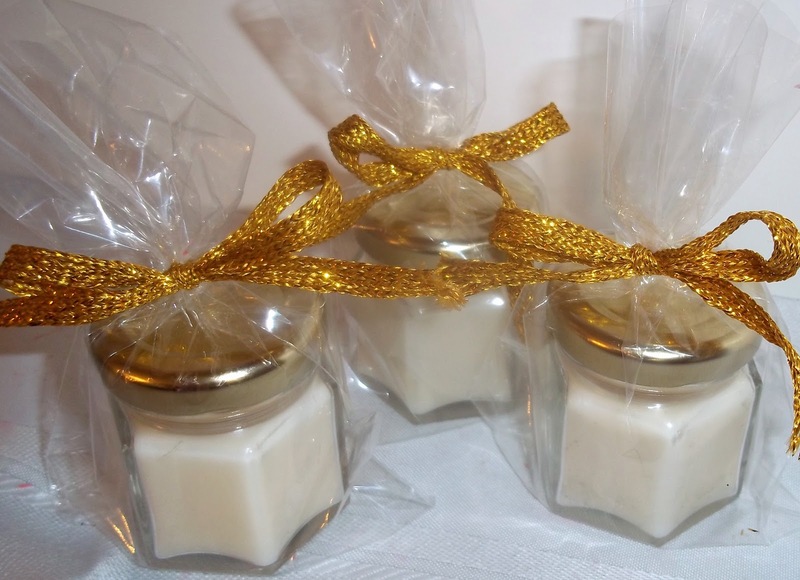 I’m excited to announce that I am now able to expand my product line into another popular candle product...votives! In order to accomplish this, I needed to take some time to experiment with other wax types. 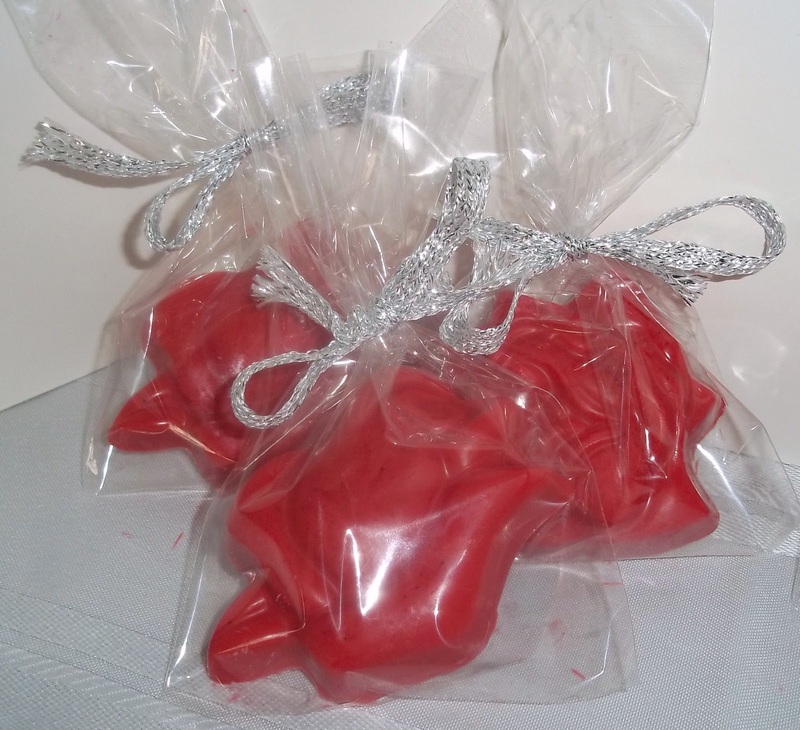 When I first decided to sell my candles, I had found a commercial brand of wax that I “understood” and could predict. Unfortunately, this brand was formulated specifically for container candles and not for free standing types such as votives. I also wanted to ensure I could create a quality candle that would hold the fragrance and color all of you have come to expect. Creating votive candles has allowed me to expand into soy wax. As many of you know, soy is an eco-friendly wax that is renewable and less harmful to our environment. 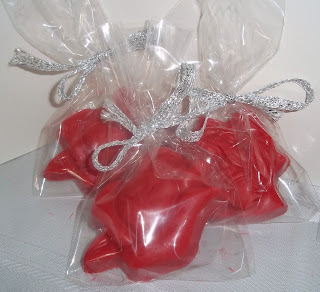 However, you may not realize that paraffin is the premium wax to hold color and fragrance. I have now created a custom blend of soy and paraffin waxes which accomplishes the best of both worlds. Fragrances in my votive line are being added slowly so I can thoroughly produce and test each scent for quality purposes before making it available to you. Please see the votive listing on page 2 for what is available as of this publication. For the most up-to-date news on what is available and for sales and specials, please “like” my facebook page at www.facebook.com/DLitesbyDorene or follow me on Twitter @DLitesbyDorene.